Sometimes data and reason aren’t enough to change people’s minds. For all the level headed arguments against parking minimums, about how current policy restricts housing supply and drives up costs, and about the unfairness of hidden subsidies for drivers at the expense of everyone else, the knee-jerk, emotional response resisting change will always be a powerful force. Those wishing to affect positive change have not only to construct reasoned arguments for it, but to tug on heartstrings as well. That’s the kind of appeal that The Sightline Institute made recently in the article “Ugly by Law”. It’s the kind of appeal that Park(ing) Day makes every year. By seeing a vision of what could be, people will also view the world as it exists with new eyes. Many have become numb to car dominated landscapes and lifestyles. 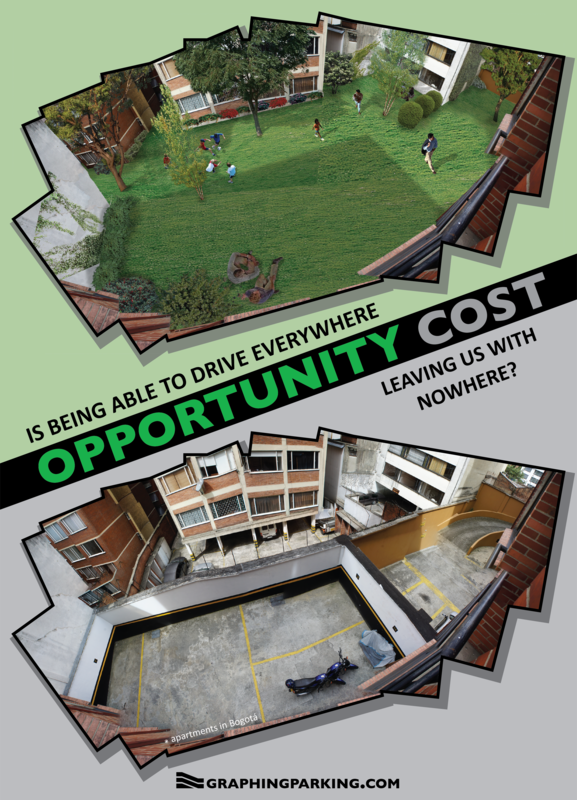 Providing a clear vision of what could have been and what we are missing out on, will bring to life the better world that will be if the space dedicated to cars can be right-sized. Showing images and examples of transformation from an on the ground, human perspective will be an important part of helping others to see that what exists now is not an inevitability, but a choice. What does our (institutionalized) obsession with cars cost us? While the above graphic features the view from my apartment in Bogotá, Colombia, I hope it will have some universal appeal. 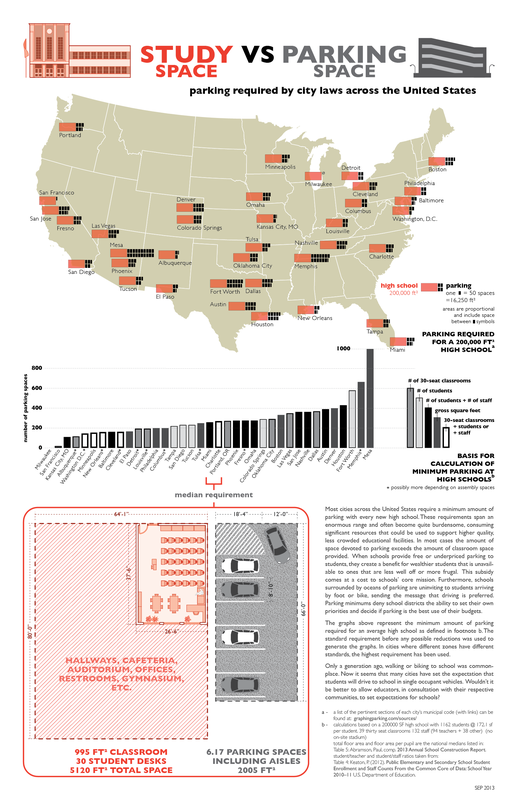 This is the final installment of a five part series documenting parking minimums across the United States. Future graphs will explore parking minimums on a more local and conceptual level and will eventually include on-street parking policy as well. There is no consensus on how to calculate minimum parking for high schools. The methods are so varied that I ended up leaving several cities off of this graphic in an effort to simplify comparisons. Still, despite my best efforts to use current national averages to build a fair basis of comparison, the numbers shown and the corresponding ranks of each city represent only one possible scenario and could shift significantly if different assumptions were used about student and staff population, built area, and/or the number of classrooms. The real lesson from this graph is the haphazardness with which minimums are calculated and the huge consequences for cities like Mesa that get it horribly wrong. Providing plentiful free parking to high school students gets them hooked on driving from an early age. It sets the expectation that driving is a rite of passage into adulthood and that any other method of getting around is immature or inferior. In a country with an obesity epidemic, that doesn’t seem to be the best lesson to teach. In a setting where equality should be a virtue, it provides a benefit to wealthier students, who have the means to drive a car, with funds that could go towards providing students (including those less well off) with a higher quality education. 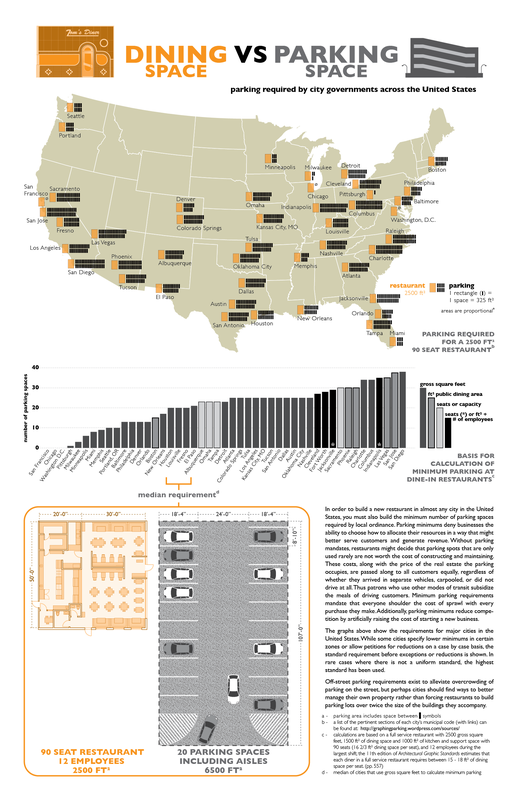 This is part four of a five part series chronicling parking requirements across the United States. Assembly spaces, including places of worship, exemplify the effect that parking minimums have on our lives. On the one hand, they follow a certain logic: many people will be packed into a small space so many cars need to be accommodated. On the other hand, it puts into clear perspective just how insane it is to assume that everyone should arrive by car. That these parking lots are only substantially occupied for a few hours, one day per week makes parking minimums for places of worship all the more obscene. 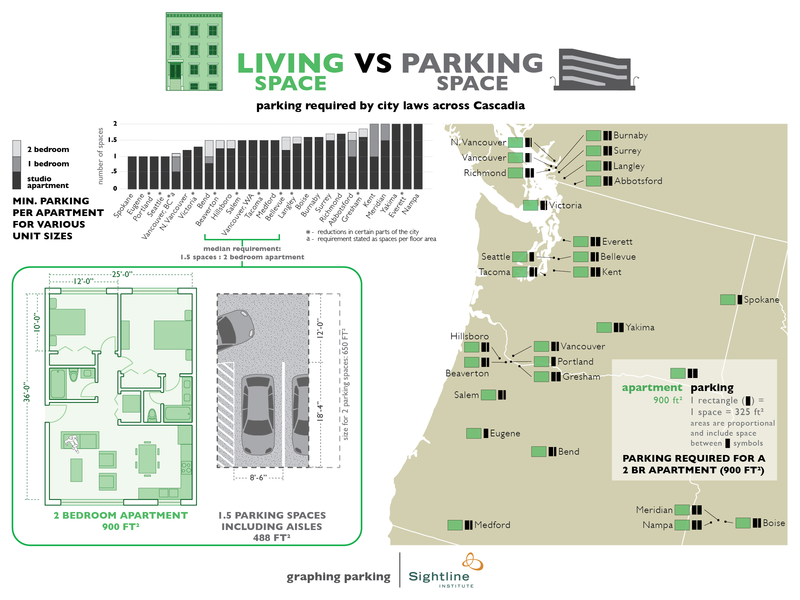 With this post I am taking a brief detour from the inaugural series of Graphing Parking to feature a graph for the Sightline Institute’s ongoing series, “Parking? Lots!” Alan Durning has been leading this in-depth analysis focused on parking policy in Cascadia. I encourage everyone to check out the article as well as the previous three installments. This graph is an adaptation of the earlier “Living Space vs. Parking Space” that I did for cities in the contiguous 48. Fortunately for me, Mieko Van Kirk and Pam MacRae of the Sightline Institute did the heavy lifting in researching each city’s requirements for this version. Two things stood out for me especially. First the common suspicion that suburbs have higher parking requirements than their principal cities has been universally upheld here. Obviously this is just one land use in a sample that includes only three major metropolitan areas, so the graph doesn’t prove definitively that this holds true as a rule. 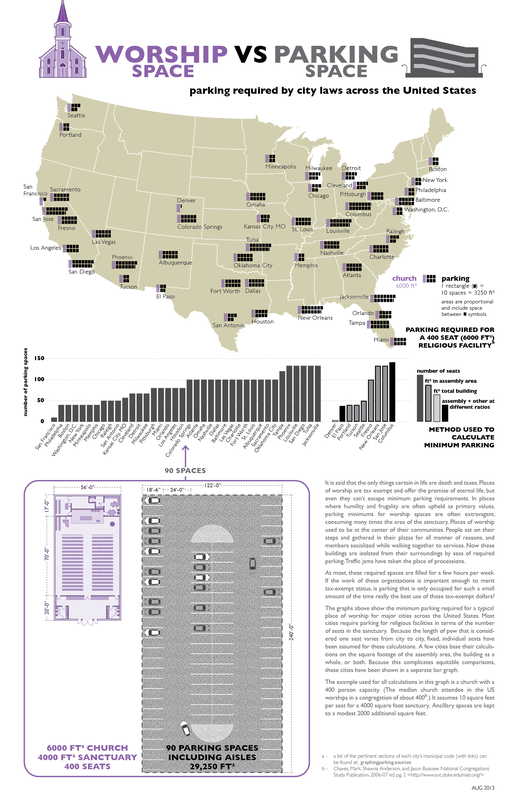 Additionally, as you can see in the previous graphs, Seattle and Portland have some of the lowest minimums in the US, so it is unsurprising that the suburbs’ are a bit higher. Nevertheless, the fact that there is not a single exception says a lot. I would be interested to see if cities with already high requirements such as Albuquerque or Jacksonville have suburbs with yet higher parking minimums. Second, this graph challenged my assumption that smaller stand-alone cities would behave just like suburbs. It’s actually a mixed bag. Spokane, Washington and Eugene, Oregon both mimic the requirements of the larger cities. It would take looking at various other uses to find out whether this similarity applies in general, but I will no longer take for granted that a relatively small (around 200,000 in the city proper) population automatically translates to higher requirements. If there are many more similar cases out there, it would go a long way towards demonstrating that cities don’t need Manhattan-like conditions to ease up on parking minimums. This is part two of the five part series documenting parking minimums for various land uses in cities across the United States. I found the graphs above to be quite stunning and while I was working on them I often had to remind myself that these are not worst case scenarios, these are minimums. Much more so than the previous entry on apartments, this set of graphics illuminates the huge amount of real estate that city governments require to be set aside for parking. The spacial mismatch between cars and people is jarring, and it becomes obvious that creating a humane, walkable urban environment is totally impossible so long as these ordinances stand.